The number of children who are uninsured in the U.S. is on the rise for the first time in nearly a decade, with 276,000 more children going without insurance in President Donald Trump’s first year in office than in 2016, according to findings released Thursday by Georgetown University. Researchers and anti-poverty advocates say it’s an unsettling uptick after years of progress, and they blame GOP-led efforts that have kept some states from expanding Medicaid. They also point to Trump’s aggressive focus on curbing immigration and say many families are too worried that signing their children up for government-backed insurance would complicate ongoing immigration proceedings. “This constellation of national trends has likely created an ‘unwelcome mat’ effect where families are unaware of their options or deterred from seeking coverage,” according to the report by Georgetown University’s Health Policy Institute’s Center for Children and Families. The report found that the number of uninsured children in the U.S. was particularly high in select states such as Texas, which has the largest number of uninsured children and 1-in-5 kids go without coverage. Texas, which opted not to expand Medicaid under the Obama-era health care law, had some 80,000 more children uninsured in 2017 than in 2016. The offices of Texas Gov. Greg Abbott and Texas Sens. Ted Cruz and John Cornyn did not return ABC News' requests for comment. But conservatives in general have argued that the number of people with insurance isn’t the best measure of success. They say affordable, quality care is a better indication of how the U.S. is faring. 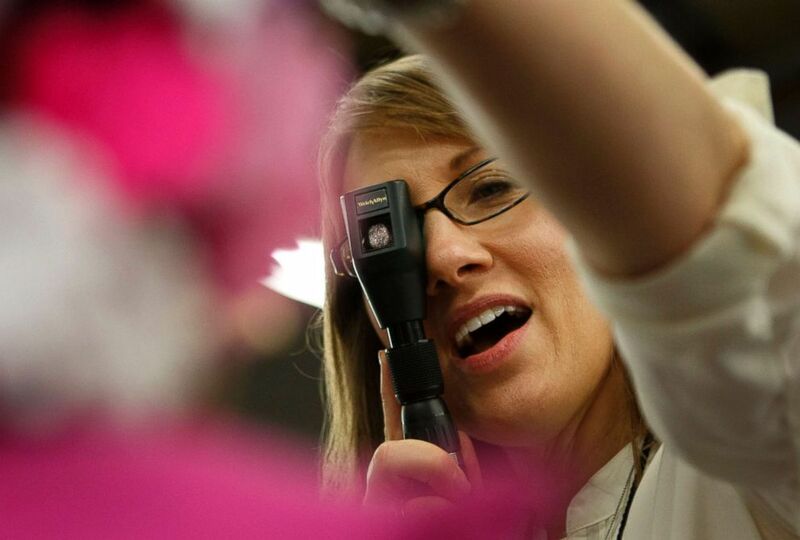 A doctor performs an eye test on a child at a health clinic for the uninsured and underinsured Los Angeles, Sept. 27, 2012. Kohler said she believes the refusal by Texas to expand Medicaid has played a major factor, as well as the state’s more stringent paperwork requirements associated with the program. Also, there are areas in the state where there are few or no outreach workers left to help people figure out if they meet the requirements to enroll in a health care program, like Medicaid or the Children's Health Insurance Program. Some uninsured children may be eligible for coverage on healthcare.gov too; the deadline for that is Dec. 15. 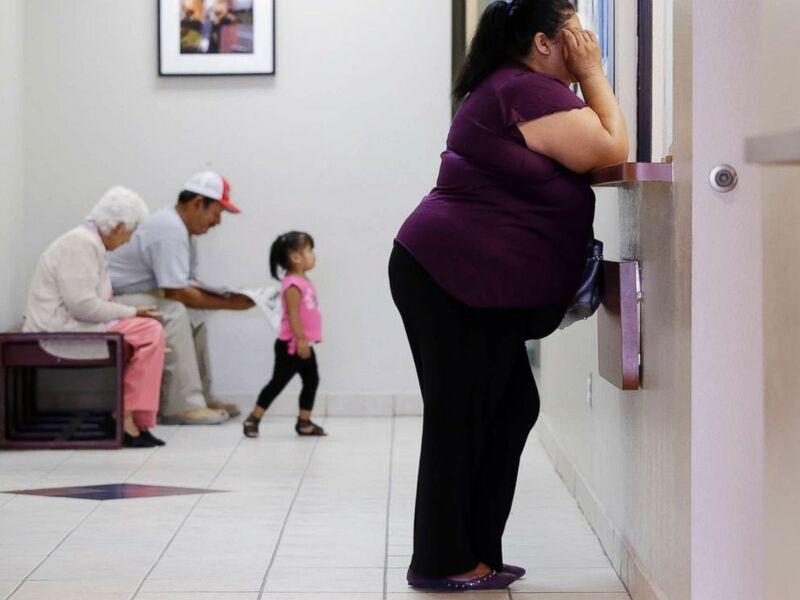 In this July 12, 2012 photo, a woman stands at the registration window at Nuestra Clinica Del Valle in San Juan, Texas. According to the Center for Public Policy Priorities, Texas spent $9.2 million in 2016 on health care "navigators," which help people find health care options. This year, that figure dropped to $1.35 million. And in some cases, Kohler said, there are parents who have asked to remove their children from any kind of government program out of fear that their family could become a target for deportation. “State leaders have to recognize we’re moving in the wrong direction for both kids and adults,” Kohler said.